In an effort to conserve energy, I wanted a way to EASILY shutoff most of these devices and still keep my PC on. A regular surge protector just wouldn’t work because 1) it shuts everything off and 2) it’s a pain to bend down under my desktop to reach the tiny on/off switch. 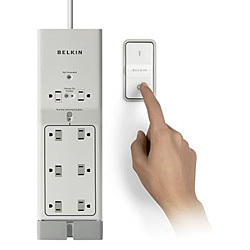 That’s when I found the Conserve Switch from Belkin, not only does it have two outlets that are always on, but it also has an easy to install switch that you can put on the wall near your light switch. So when I leave my office, I turn both switches off. This $40 product will save me about $60 in electricity each year.